In seven remarkable pages of prepared testimony, Comey describes a president obsessed with loyalty and publicly clearing his name amid an FBI investigation of his associates, and the FBI director's growing unease with the nature of the demands being made of him in their private conversations. Washington: Fired FBI Director James Comey said President Donald Trump told him at the White House "I need loyalty, I expect loyalty" in their private White House dinner conversation in January, according to written remarks from Comey offering a vivid preview of his testimony Thursday before the Senate Intelligence Committee. Since firing Comey last month, the president has denied reports that he sought a pledge of loyalty from the FBI director amid a Justice Department probe into possible coordination between Trump associates and Russian operatives. Comey's written remarks do support another Trump claim - that the FBI director repeatedly assured the president that he was not personally under investigation. But overall, Comey's testimony portrays Trump as a domineering chief executive who made his FBI director deeply uncomfortable over the course of nine separate private conversations, beginning with their first meeting in early January before Trump was sworn into office. In that conversation, Comey warned the president-elect of a dossier that was circulating with unsubstantiated allegations against him and his advisers. Senate Intelligence Committee Chairman Richard Burr, R-N.C., who is leading the Senate probe of possible Russian coordination with Trump associates, said he was not alarmed by Comey's account. "I don't think it's wrong to ask for loyalty of anyone inside an administration," Burr said. "I don't think of what I've read there's anything of wrongdoing." "It was unclear from the conversation who else was going to be at the dinner, although I assumed there would be others," Comey wrote. "It turned out to be just the two of us, seated at a small oval table in the center of the Green Room. Two Navy stewards waited on us, only entering the room to serve food and drinks." The president began the conversation, Comey wrote, by asking him whether he wanted to stay on as FBI director, "which I found strange because he had already told me twice in earlier conversations that he hoped I would stay, and I had assured him that I intended to." The president replied, according to Comey, that lots of people wanted his job and "he would understand if I wanted to walk away." Comey's instincts, he wrote, were that both the setting and the conversation "meant the dinner was, at least in part, an effort to have me ask for my job and create some sort of patronage relationship. That concerned me greatly, given the FBI's traditionally independent status in the executive branch." 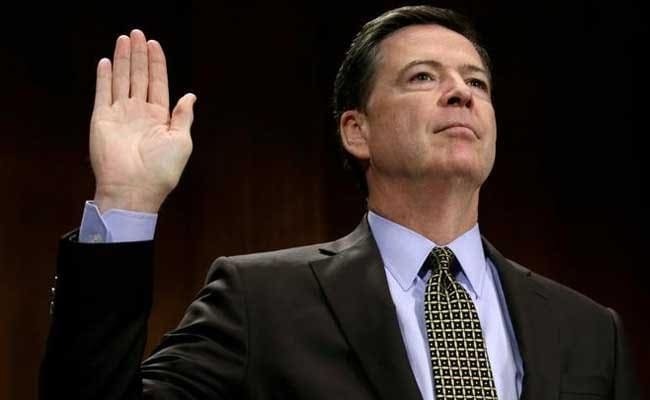 When prompted again on the subject of loyalty, Comey said he replied, "You will always get honesty from me." Comey said that once before Trump's inauguration, and again at the January dinner, he assured the president that he was not personally under investigation. He also told the president later on that he had shared that information with congressional leaders. In his letter firing Comey, Trump wrote that three times Comey had assured him he was not under investigation. After the firing, Comey's defenders publicly challenged the accuracy of that statement. Overall, Comey's written testimony describes a strained, awkward relationship between the two powerful men, punctuated by exchanges in which the president expressed his displeasure about the Russia probe in ways that alarmed the FBI director. Even the number of contacts between the two were alarming to Comey, who noted that he only spoke twice privately with President Barack Obama. When the door by the grandfather clock closed, Comey wrote, the president said, "I want to talk about Mike Flynn'' - the former national security adviser who was forced out after disclosures about his conversations with the Russian ambassador to the United States, Sergey Kislyak. Flynn had resigned a day earlier. Then, in late March, Trump called Comey at the FBI. In that conversation, the president called the Russia probe "a cloud'' hanging over his ability to lead the country. "He said he had nothing to do with Russia, had not been involved with hookers in Russia, and had always assumed he had been recorded when in Russia,'' Comey wrote. "He asked what we could do to 'lift the cloud.' I responded that we were investigating the matter as quickly as we could, and that there would be great benefit, if we didn't find anything, to our having done the work well. He agreed, but then re-emphasized the problems this was causing him," Comey wrote. After that phone call with the president, Comey said he called acting deputy attorney general Dana Boente to tell him what was discussed and to "await his guidance." Comey said he never heard back from Boente. A spokesman for Boente did not immediately respond to a request for comment. Then, on April 11, Comey wrote, the president called him and asked him what he had done about getting out word that he was not personally under investigation. The president told him "the cloud" of the probe was interfering with his ability to do his job. "I have been very loyal to you, very loyal; we had that thing you know," Trump told Comey, according to the written testimony. "I did not reply or ask him what he meant by 'that thing.' "
He added: "That was the last time I spoke with President Trump." The Washington Post's Sari Horwitz and Karoun Demirjian contributed to this report.